This is for general information of all the candidates who applied for various Grade-IV posts against the advertisement No. Janasanyog/D/12591/17, Dated: 13.01.2018, (The Assam Tribune), that the written test shall be held on 22/07/2018 . The Call Letters (Admit Card) shall be available at the Office website of Gauhati Medical College & Hospital, Guwahati i.e. www.gmchassam.gov.in from 16.07.2018 at 3 P.M. onwards. 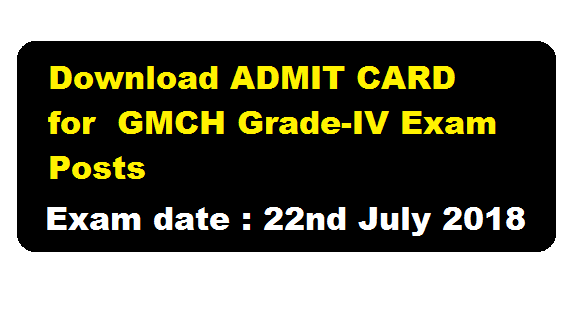 Please go through the instructions for Download Admit Card . 2. Confirm it by matching your father’s name. Note : It is to be mentioned here that no call letter shall be sent to the candidates by post individually.